Want some skull with that? 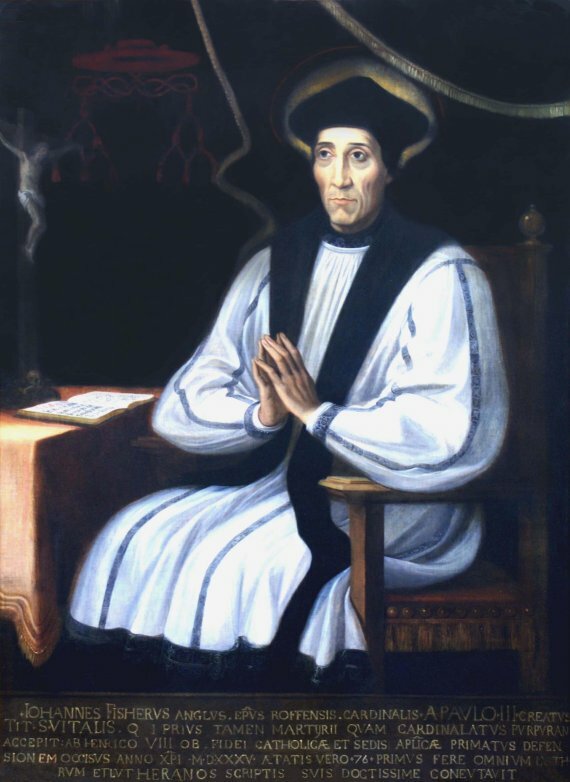 Together with St. Thomas More, Today is the feast day of St. John Fisher. Both are important martyrs of our Church who defended Mother Church zealously in England during the Reformation. Fisher was born in 1469 and was chancellor at Cambridge University at one point. Later, while still chancellor at Cambridge, he became bishop of Rochester (England’s smallest diocese) after turning down larger sees. Later he became a cardinal. He preached at the funeral of King Henry VII and Lady Margaret. Always a scholar, Fisher wrote against Martin Luther, particularly in terms of the sacraments. The Council of Trent, which met ten years after Fisher died in 1535, relied heavily on Fisher’s writings. When Henry VIII was seeking divorce from Catherine of Aragon, Fisher was the one who submitted time and time again that his marriage was valid and there were no loopholes he could jump through to get out of it. Henry VIII grew in his hatred of Fisher and eventually had him beheaded after having locked him up for ten months in the Tower of London. He was 66 when he died but looked 86 since he was so unhealthy and unfed. He prayed the Te Deum during the final few moments of his life. Henry hated Fisher so much that even after he was dead, he hung his body all day and did not allow any funeral rites. He placed Fisher’s head on the London Bridge for two weeks. Interesting fact about Fisher, he kept a skull on the table when he ate so that he would never forget about death. There’s an idea! St. John Fisher: pray for us!